Parents are always an important part of a wedding day, and for this Cravens Estate wedding in Pasadena, it was no different. In terms of photography, the mother of the bride and the mother of the groom are typically as excited or more excited about the photography than the couple. As such, I take particular care to create certain photographs that I know the parents will love. In addition to the traditional wedding photographs you might expect, I tried to create circumstances where parents and their children can interact in ways that will reflect both their personalities and their relationship between each other. When I'm creating these images, I'm always trying to think of ways to make the photograph special, particularly in the decades to come. What parent wouldn't love this photograph? 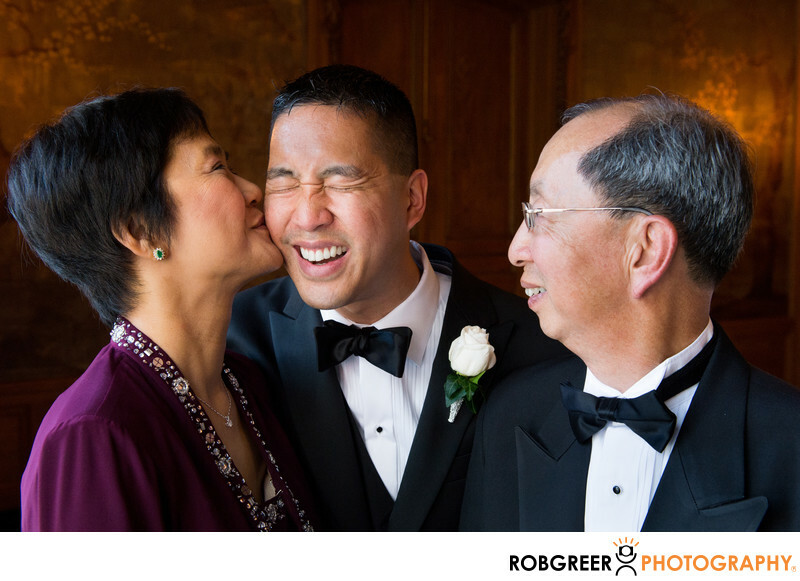 In this photo, the mother of the groom kisses him on the cheek while his father looks on bemused. As you can see from the groom's expression, this kind of interaction between the mother and her son is uncommon, but he laughs at the experience. I've positioned the group near a large window for this photograph which creates a beautiful light on everyone's face. In the background, while sconces create a golden light that presents a subtle halo around their heads. Due to the dark nature of the background, this creates an excellent separation of the subject and provides a sense of depth. Cravens Estate (American Red Cross) is located in Pasadena, California. Contact Person: Tim MacDonaugh, (626) 720-3544. Location: 430 Madeline Dr, Pasadena, CA 91105. 1/60; f/5.6; ISO 2000; 45.0 mm.